What is self-regulating pipe trace heat tape? Pipe Freeze Pro heat tape is a self-regulating pipe trace heating cable. Self-regulating means, as the temperature gets colder, the cable creates more heat by drawing more power. When it gets warmer, it produces less heat by drawing less power. This allows you to consume only the energy you need to help protect your pipes from freezing. This pipe trace heat tape adjusts heat output to equal the heat loss of the pipe it is installed on. As pipe temperatures fall, our heat tape calls for more power because the carbon-populated core of the cable shrinks microscopically, decreasing the space between the carbon atoms and thus increasing the conductive pathways between the two main bus wires of the cable. More pathways equals more electrical resistance, which in turn equal more heat. ⚠ Notice: Heat Tape purchased in big-box stores is constant wattage heat tape. “Constant wattage” means: it is always on. It’s always drawing full power and costing you peak energy expenses, which –over the length of a season– can add up huge. Thought you were saving money on that heat tape you got at that home improvement store? Guess again. How does pipe trace heat tape “self regulate”? The core of our pipe trace heat tape is two bus wires encased in a material that is, in part, carbon. As ambient temperatures decrease, the material shrinks pulling the bus wires closer to each other, creating the electrical reaction which makes the cables heat up. When ambient temperatures remain warmer, the inner core doesn’t shrink, preventing higher temps from occurring within the cable. Can I accomplish this with constant wattage heat tape and a “switch” or thermostatic control? No, not really. Because any control or switch is still going to tell your constant wattage cable to be either off or on at 100% power. It is very binary in how it behaves. Conversely, self-regulating heat tape will output variable temperatures based on the external, ambient temperature. So when it’s 31ºF or 10ºF constant wattage heat tape will always be on full heat, where self-regulating heat tape will only use just enough power to be at the temperature you need to prevent ice dams from forming. There’s also some safety considerations. Since constant wattage heat tape needs to perform in ranges of cold, you can imagine the operating temperature is pretty warm. Additionally, since it it’s temperature isn’t variable like self-regulating heat tape, that heat is always on full whether it’s 50ºF or 10ºF. This heat can lead to increased risk of fire, especially in warmer ambient temps and dryer conditions. How Hot does Your Heat Tape Get? Radiant Solutions Self-Regulating Heat Tape changes its heat output based on the temperatures of its surrounding environment. At any given point, depending on the temperatures outside, the cable could be a range of temperatures. However, its peak temperature is not very hot –typically between 95º-110º. Mainly because once the cable has heated the immediate area around it, the self-regulated aspect of the cable kicks in and prevents it from getting too warm. This gives our Heat Tape a great advantage over the heat tape you can buy in ‘Big Box’ retailers, because it creates enough warmth to effectively do its job, but won’t do damage to surfaces that it touches. Additionally, our heat cable can be touching/overlapping when used. Heat Tape that is not self-regulating can not do this (they have explicit warnings in the directions not to do this for risk of fire). How do I know if the heat tape is working? Pipe Freeze PRO heat tape will be warm to the touch within 30 minutes of being plugged in. Does Pipe Freeze PRO heat cable come with a thermostat? The nature of our advanced self-regulating cable design means that a thermostat is not necessary. Pipe Freeze Pro heat cable senses ambient temperature along it’s entire length, meaning that the cable itself demands more power (and produces more heat) at areas where the cable is cold. The addition of a thermostat can add greater efficiency but it is not necessary for proper cable performance. Can Pipe Freeze PRO heat tape be used on hot water pipes? However, self-regulating heat cable should not be installed on surfaces or pipes that exceed 184º F.
Can heat tape be used inside a pipe? Pipe Freeze Pro heat tape can be use to promote drainage through pipes such as concrete culverts and plastic culverts. Should Pipe Freeze PRO heat tape be covered with insulation after installation? Our self-regulating heat tape (and all others) should be covered with standard 1/2” thick pipe insulation after it is secured to the pipe. This greatly enhances the performance of the heat cable. How should I secure heat trace heat tape to pipes? You can use any tape with a minimum temperature rating of 176º F, with fiberglass cloth tape being the most common. Self-adhesive aluminum foil tape an be used to fully cover Pipe Freeze PRO heating cables. 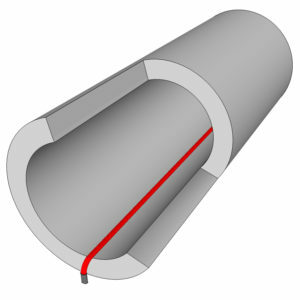 The aluminum material helps spread conductive heat to the pipe. Standard tape, including electrical tape and duct tape, lose their adhesion when exposed to the heat generated by pipe trace heat cables over time. Do you install heat tape on pipes? We have Pipe Freeze PRO heat tape installation partners around the United States and Canada. Click here to submit your information to us. We’ll respond quickly and let you know if your project falls within one of our service areas. Can you overlap Pipe Freeze PRO heat tape when installed on pipe? Pipe Freeze PRO heat tape can be overlapped during installation. ⚠ Warning: Big-Box Store constant wattage heat cables can not be overlapped without the risk of electrical shorting, cable burnout or even fire. Can self-regulating heat tape be buried behind walls, inside home framing, inside concrete, etc? Heat tape cables should not be installed in any permanently hidden areas. Can heat tape melt plastic pipes? Our self-regulating Pipe Freeze PRO heat tape can not get hot enough to melt pipes. It is quite safe and reliable for pipe freeze protection in a variety of circumstances. Can heat tape be used on plastic pipes, PVC pipes, ABS pipes or PEX pipes? Pipe Freeze PRO heat tape can be used on all varieties of pipes including PEX, ABS, PVC, Nylon, Steel, Copper and more. What is the difference between heat cable, heat tape and heat trace? The terms heat cable, heat tape and heat trace are all used interchangeably to described heated cables used to protect pipes from freezing, preventing roof and gutter ice dams from forming and safeguarding temperature sensitive components.